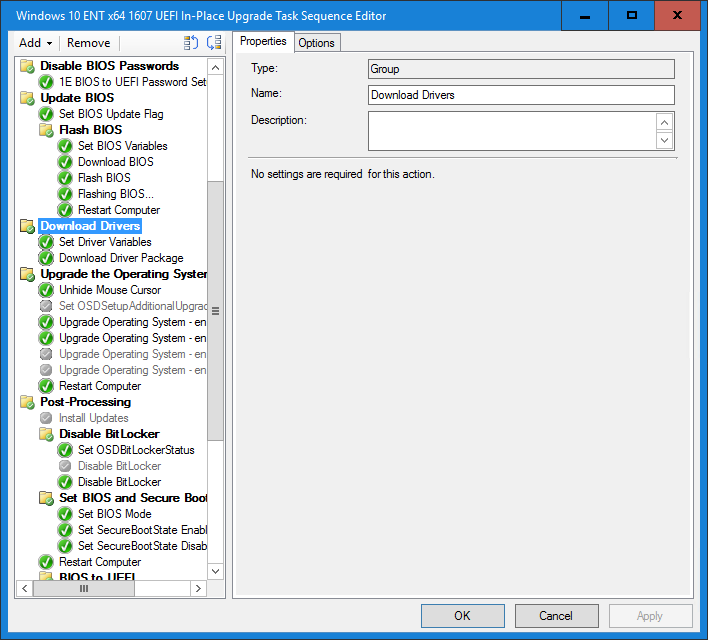 There are a lot of blogs out there on how to manage drivers and BIOS updates with Configuration Manager, however, each of them fall short of the above requirements in one way or another. I first started out on this quest back in 2015 when I was investigating what it would take to go from BIOS to UEFI. Long story short, you need to use the vendor utilities (or methods) to change the firmware settings and they worked the best when the BIOS was running the latest version. I wanted to be able to flash the BIOS in the full OS, as well as WinPE (requirement #1). This meant that Configuration Manager Packages needed to be used since Applications cannot be used in WinPE. This way, the same process could be used regardless if the system was bare metal from the vendor or an existing machine that was getting a refresh or in-place upgrade Task Sequence (requirement #2). By the way, some vendors still have limitations on flashing the BIOS in WinPE x64, but a lot of models now support this for the most part. Another goal was to be able to do this without having a 5 mile long Task Sequence that needs to be edited every time there was a new model, new BIOS version or new Driver Package (requirement #3). Every time a Task Sequence changes, it has the possibility of stopping imaging for the environment while replication takes place. If you have a small environment, this may be okay, but in a large environment it can be like stopping a production assembly line (not good). Next, the solution needs to be able to support BIOS versions and Driver Packages that are marked as production, as well as support BIOS versions and Driver Packages that are pre-production (requirement #4). This way a proper Test > QA > Pilot > Production methodology can be carried out using the current production Task Sequence (this is the Total Control part). 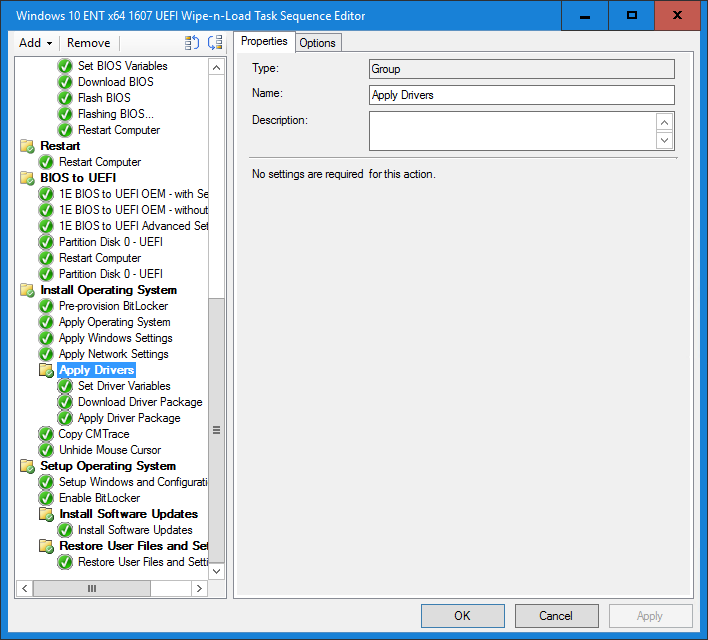 If you look at the BIOS releases or driver releases over the past two years, you will notice that the hardware vendors have been busy releasing updates. As newer versions of Windows 10 get released, the vendors usually release new drivers starting a month after the CB release. Lastly, the solution needs to be intuitive and easy to use so that it can be managed by junior level administrators (requirement #5). At the 2016 Midwest Management Summit, I had come up with a solution that covered most of the above requirements for doing the BIOS updates. At the time, I had split each of the vendors because it made it more modular, but also because some vendors (to remain nameless) at the time did not support flashing under WinPE x64. The only thing that I did not have figured out was how to do the dynamic content location request. In the Task Sequence below, I was cheating by creating a dummy group handle the CLR (the dummy group is one that does not execute but the TS does not know it and will still do the CLR at the start of the TS). So by now you are probably thinking that this is all too good to be true and there has to be a catch. No catch – it is really this simple. 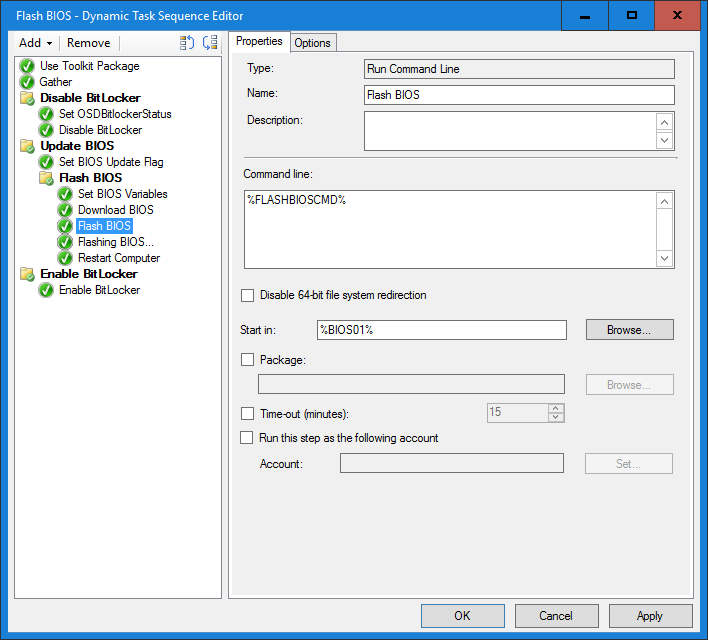 In Configuration Manager Dynamic Drivers & BIOS Management with Total Control Part 2, I go into detail on how to set up, configure and use the solution. Mike – do you offer exports of your task sequences and scripts? 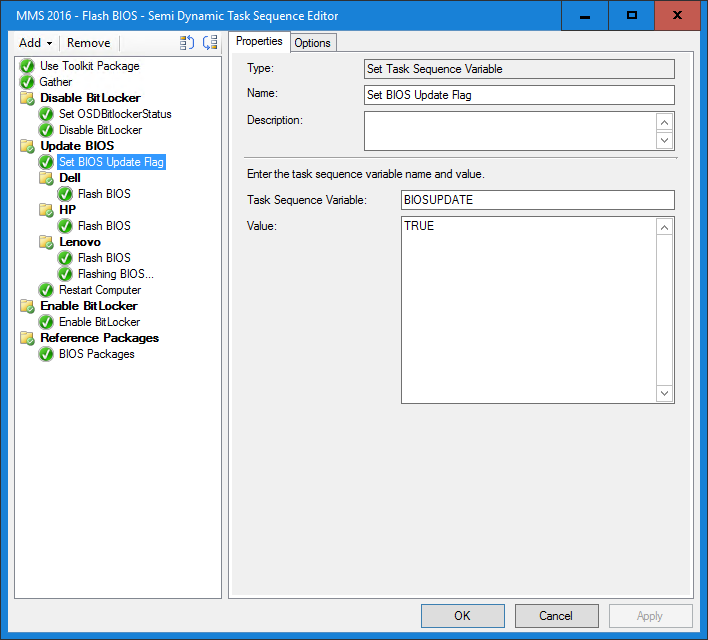 I will be making both of my Task Sequences downloadable in Part 2 of my Configuration Manager Dynamic Drivers & BIOS Management with Total Control blog post. Way to go, Mike! Can’t wait until part 2.